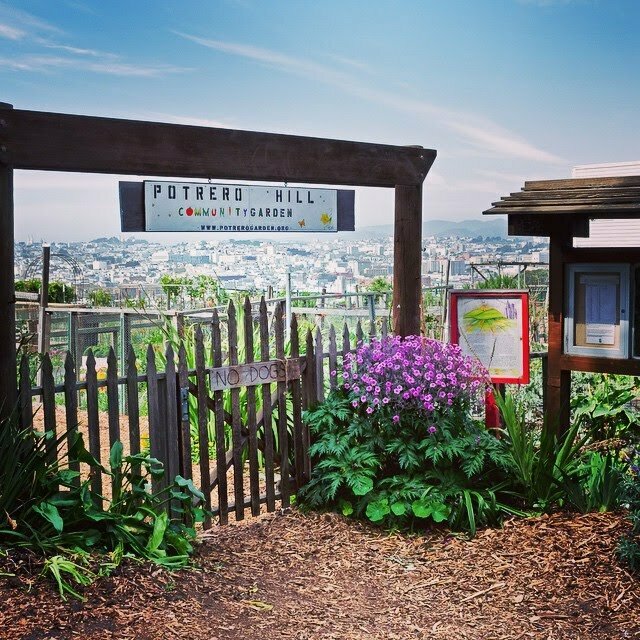 Established in the early 1970s, the Potrero Hill Community Garden is one of dozens of gardens operating under the San Francisco Recreation and Parks Department. Membership is open to any resident of the city. Located on a once-vacant lot above the slopes where the "Goat Lady" of Potrero Hill used to graze her herd, the garden now consists of 51 plots and common areas maintained by local residents using only organic methods. The garden boasts of panoramic views of the Mission, Twin Peaks, and beyond. Its sunny, Mediterranean climate permits cultivation of fruits, vegetables, and ornamentals, including dahlias -- the official flower of San Francisco.